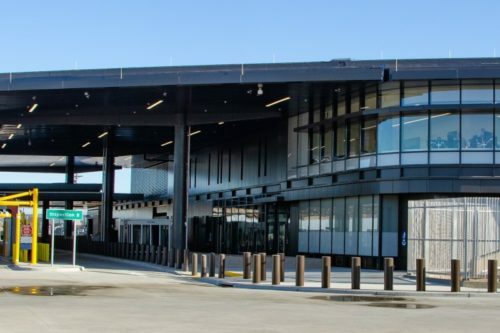 CALEXICO–The federal budget that was signed into law February 15 includes $191 million in appropriations for the U.S. General Services Administration (GSA) to proceed with construction for continued improvements and expansion of existing infrastructure at the Calexico West Land Port of Entry (LPOE). A total of $275.9 million was proposed in Fiscal Year 2019 (FY19) President’s budget request to Congress before the lesser amount was appropriated. Construction of a new pedestrian inspection building remains part of the planned replacement of the port and will be completed once the balance of the project budget is appropriated in a future fiscal year. The $191 million allocation includes Phase 2 construction of six additional northbound non-commercial vehicle inspection lanes with an associated secondary inspection facility, five southbound non-commercial vehicle inspection lanes with canopies and inspection booths, a new administration building, and an employee parking structure.